The latest addition to the British marque’s award-winning range, comprising the XF, XJ and F-TYPE, the XE was launched at a glittering event held at the Four Seasons Resort Dubai at Jumeirah Beach. “Jaguar sales in the UAE have been on an steady growth path and our Sheikh Zayed Road showroom has just been declared as the world’s largest selling single facility by volume for the brand in 2014- 2015. With the launch of the game changing Jaguar XE, and the arrival of the all-new Jaguar XF later in the year, we expect this momentum to continue through the rest of the year and into 2016,” said Ashok Khanna, Chief Executive Officer, Al Tayer Motors. The Jaguar XE with a starting price of AED 169,000/- is available to book through Al Tayer Motors Jaguar showrooms in Dubai and the Northern Emirates, and Premier Motors Jaguar showrooms in Abu Dhabi and Al Ain. The price includes a five year / 250,000kms warranty and roadside assistance as well as five year / 65,000kms service contract. UAE entrepreneur, motivational speaker and the newly appointed ambassador for Jaguar, Anas Bukhash, made his first public appearance at the event post his announcement as one of the four ‘Forward Thinkers’ for the brand in the region. 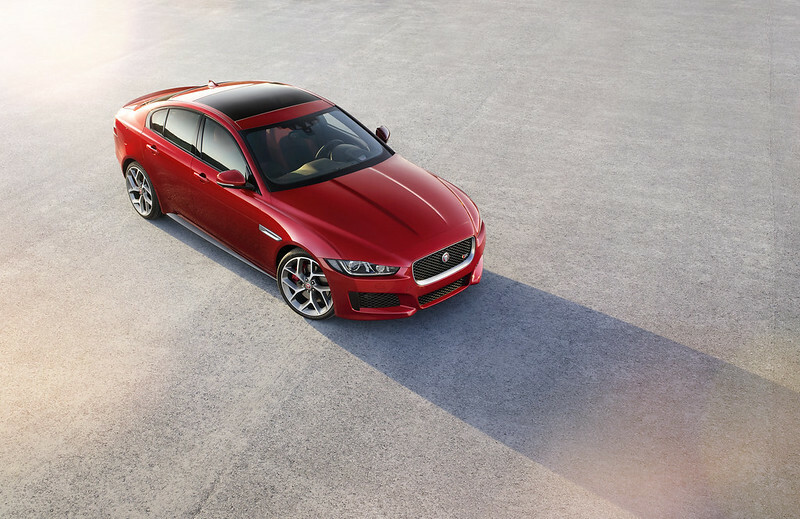 The Jaguar XE redefines the concept of the sports saloon and will be the driver’s car in its class. Its lightweight construction, streamlined styling, luxurious interior and outstanding ride and handling are testament to company founder Sir William Lyons’ vision: ‘The car is the closest thing we will ever create to something that is alive’. 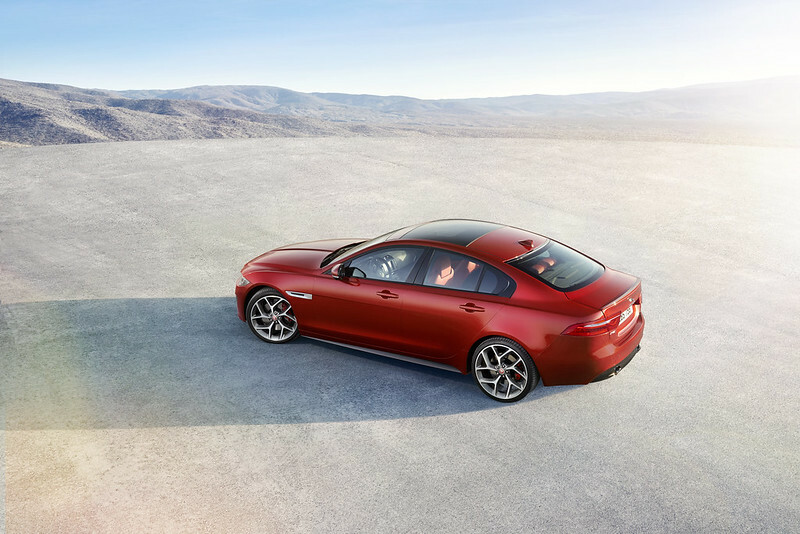 The rear-drive Jaguar XE is the only vehicle in its class to use an aluminium-intensive monocoque. 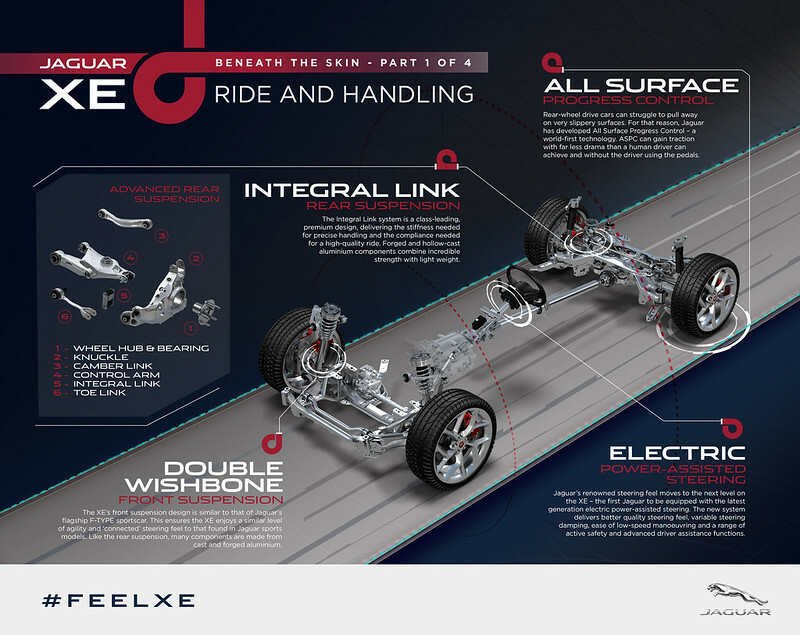 This extremely robust yet light structure, together with double wishbone front suspension and an Integral Link rear axle, is fundamental to the XE’s innovative benchmark vehicle dynamics. The Jaguar XE is available in the UAE with a range of engines, beginning with the turbocharged, direct-injection, 2.0-litre four-cylinder engine, which made its debut in the Jaguar XF and XJ saloons. Further refined for the new Jaguar XE, the lightweight powerplant is available in two ratings: 200PS/280Nm and 240PS/340Nm. For customers demanding superior performance and an exhilarating engine note from idle right up to the redline there’s the Jaguar XE S, which shares its 340 PS supercharged 3.0-litre V6 with the lightweight F-TYPE sports car. The Jaguar XE S rewards drivers with the responsiveness and refinement of its supercharged 3.0-litre V6 engine and 340PS/450Nm of torque enabling acceleration from 0-100kmh in 5.1 seconds (0-60mph in 4.9 seconds), and an electronically-limited maximum speed of 250kmh (155mph). The Jaguar XE has some of the most advanced driver assistance systems available. All Surface Progress Control (ASPC), developed through decades of Jaguar Land Rover experience in off-road traction systems, can electronically gain traction in seconds and is ideal for use on low-grip surfaces, such as snow-covered roads. An optional stereo camera is mounted behind the front windscreen to give the Jaguar XE a 3D view of the road ahead: this highly accurate data is used for functions including autonomous emergency braking and a lane departure warning system. The Jaguar XE is the stiffest, most aerodynamic Jaguar saloon car ever built. It is also the first Jaguar to be equipped with electric power steering, tuned to provide exceptional responsiveness and feel but with lower energy consumption than hydraulic systems. 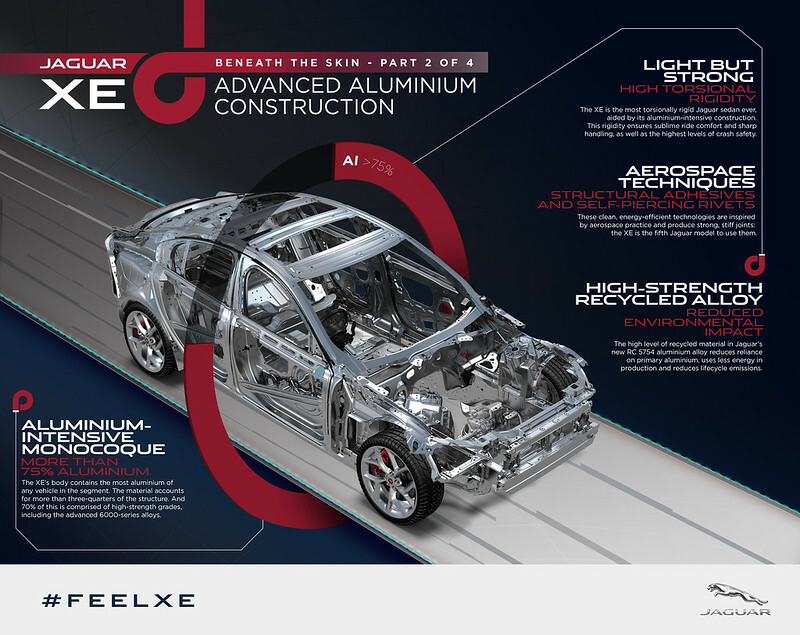 The aluminium-intensive Jaguar XE is manufactured at Jaguar Land Rover’s Solihull plant in an all-new facility.